Brownstoner dubbed Atlantic Yards developer Bruce Ratner the #1 Most Influential Person in Brooklyn. If only this wasn’t true. On the national level, with two short weeks left until the Presidential election, Gotham Gazette brings us two articles on the candidates’ urban policy. Finally, we’ve been meaning to cover this one for a while: Transportation Alternatives released a study on October 15 called Guaranteed Parking – Guaranteed Driving (PDF). It shows that current City requirements for off-street parking encourage driving. “City Planning’s parking requirements do more than encourage car ownership. They ensure that new New Yorkers will be much more likely to drive to work than today’s New Yorkers. Bad planning is gradually transforming us from a transit and walking city into a driving city,” said Paul Steely White, Executive Director of Transportation Alternatives. Photo of City Councilmember Letitia James of Brooklyn, who opposed the term limits extension, at yesterday’s vote via New York Times. “Billions of Federal dollars will be spent over the next 25 years to improve the region’s transportation system, and the New York Metropolitan Transportation Council (NYMTC) wants your input into how that money should be spent. NYMTC’s 2010-2035 Regional Transportation Plan will lay out a long-range framework for improving the region’s transportation system – its roads, bridges, freight and mass transit facilities, and its bicycle and pedestrian networks. Interactive workshops are being held throughout the region to encourage your comments, ideas and suggestions for your community’s transportation future and to discuss the new Plan, including various trends and issues, NYMTC’s shared goals for the region and its proposed development vision, and the regional socio-economic and demographic forecasts that will form its foundation. THIS IS YOUR CHANCE TO HELP PLAN TRANSPORTATION IMPROVEMENTS IN YOUR COMMUNITY FOR THE NEXT 25 YEARS. YOUR CONCERNS AND ISSUES MATTER! Last month, Mayor Bloomberg and other City officials (along with Transportation Alternatives’ Paul Steely-White, cyclist Lance Armstrong and, strangely, musician David Byrne), announced the Summer Streets pilot project, which will close Lafayette Street/Park Avenue to traffic between the Brooklyn Bridge and 72nd Street for three Saturdays in August. Now, community groups in Williamsburg, Brooklyn, including the Northside Merchants Association and Task Force members Neighbors Allied for Good Growth, as well as the website Billburg.com, have teamed up to bring a similar experiment to Bedford Avenue, the neighborhood’s main drag. Interested in reclaiming a street from cars in your neighborhood? Check out the New York City Streets Renaissance (NYCSR)’s Block Party NYC page, where you can find a list of this summer’s NYCSR’s-sponsored block parties, and apply for a grant to host one next year. Today, NYC Council Transportation Committee Chair John Liu announced that he has organized an oversight hearing on G train service. 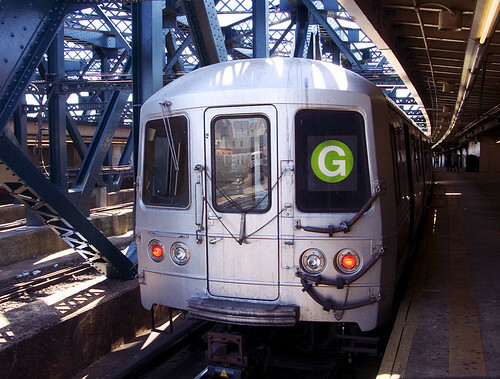 Witnesses from the MTA will be asked to speak about ridership data, plans for the future, conditions, and other issues regarding G line service, and the public is also encouraged to testify about their own experiences. From our friends at the Regional Plan Association: The MTA is offering one last chance for you to weigh in on its fare and toll plan. On Monday, December 10th at noon, a special “webinar” – a virtual web-based forum – will be held so you can give your valuable opinion on this important topic from the ease of your home or office. Once registered, you will be able to take part in a live conversation with MTA leadership about the MTA financial situation, the fare and toll increase proposal, and the capital plan. Participants will be able to submit written questions in real time to the presenters who will then answer them orally at the end of the presentations. All you need to participate is a phone and access to the Internet. The event is being co-sponsored by a coalition RPA is part of – the Empire State Transportation Alliance, a coalition of business, labor, environmental and civic groups dedicated to seeing a robust transportation investment program to sustain New York’s economic growth and environmental quality.